Your IBD doctor will often order certain tests to monitor disease activity along the way, but also to assess how medications are working and if they are having any adverse effects on your other organs or body systems. People with inflammatory bowel disease (IBD) are treated with a variety of medications, many of which have different ways of acting on the body. In most cases, adverse effects are rare, but they can be caught early so it’s worth doing the tests to ensure treatment goes smoothly. Guidelines for testing before starting certain therapies are just that: guidelines. Every physician and IBD center will do things differently. However, it’s important for people living with IBD to have an overview of what could be the level of care when starting certain medications. This is especially true when not being seen at an IBD center or if most care is being overseen by another member of the team (such as an internist or a primary care physician). People with Crohn’s disease or ulcerative colitis who have questions about the lab work and other tests recommended while taking IBD medications should consult their physicians. Azulfidine is a sulfa based drug containing 5-aminosalicylic acid (5-ASA) and sulfapyridine. It's used to treat ulcerative colitis as well as other inflammatory conditions such as rheumatoid arthritis and ankylosing spondylitis. This drug has a long history of safe use for ulcerative colitis, but it is now being used less often as newer drugs that are more effective and have fewer side effects (headaches and nausea) are developed. In general, monitoring tests other than a CBC count aren’t typically recommended while receiving this drug. This blood test may be done before starting therapy with Azulfidine and then again every other week or monthly for the first six weeks to three months. After that, the test might be recommended monthly for three months and then every three months for the remainder of the time the Azulfidine is being taken. This is to check for some rare adverse effects such as a decreased white blood cell count (the condition is called agranulocytosis). Most cases of agranulocytosis occur within the first three months of treatment. Long-term use of steroids such as prednisone are on the wane as a treatment for IBD, but they are still used in certain cases or along with other medications. One of the main considerations with the regular use of prednisone is the risk of bone loss. A DEXA scan might be recommended before starting corticosteroid therapy. After that, it might be done again after two to three years, or sooner for people who have osteoporosis or who have had another sign of bone damage, such as a fracture. If the DEXA results show that there is some bone loss, treatment might be started and other tests might be done. Cyclosporine is a type of immunosuppressant drug that dampens the immune system. It is sometimes used for ulcerative colitis and Crohn’s disease, but also to prevent organ rejection after a transplant and for other inflammatory conditions such as lupus, rheumatoid arthritis, and psoriasis. A few tests may be ordered during this treatment. In order to ensure that enough of the drug is in the body to be effective, or that the drug levels don’t get too high and cause adverse effects, drug levels might need to be measured through a blood test. People’s bodies react differently to the drug and levels in the blood can be affected by a host of factors. At the start of therapy with cyclosporine, testing might be done as frequently as daily until the right dosage is achieved. After that, testing might be done weekly, monthly, or more infrequently. It could be bumped back up again if there’s a change, such as if symptoms get worse or another drug is needed and it affects the cyclosporin level. The frequency of this blood test is going to vary based on physician preference, but in general, white blood cell count, red blood cell count, hemoglobin, and hematocrit will be monitored periodically. Patients may be asked to collect urine for a urinalysis. The results of this test can help monitor for problems with the kidney and the liver. It may be ordered every so often while taking cyclosporine to ensure that the drug is not leading to any adverse effects on those organs. To ensure that the cyclosporin is not causing harmful side effects, a physician may order other tests to monitor kidney and liver function, including levels of blood urea nitrogen (BUN), bilirubin, magnesium, potassium uric acid, lipids, and liver enzymes. Imuran (azathioprine) is an immunosuppressive antimetabolite drug that is prescribed to treat IBD and other inflammatory conditions such as rheumatoid arthritis. Imuran might be used by itself or at the same time as other medications (such as corticosteroids) in order to help those medications work more effectively. While receiving Imuran, patients will be monitored closely for side effects. For the first month, this blood test might be done weekly, followed by every other week during the second and third months, and then monthly after that. If there’s a dosage change, the process of weekly and then every other week might be started again. This test might be done before receiving any of the thiopurine drugs, which include Imuran, mercaptopurine (6-MP), and thioguanine. The TPMT enzyme level is usually checked through a blood test, but if only a genetic test is being done the test might be completed by swabbing some cells from inside the cheek. It’s important that this test is done before taking the medication in order to get a true representation of the TPMT enzyme level. This test is done because TPMT is the enzyme in the body that breaks down Imuran and other similar medications. If the level of TPMT in the body is somewhat low (which occurs in about 10 percent of people) or very low (which occurs in about 0.3 percent of people), taking a thiopurine drug like Imuran could cause serious side effects. There are several different preparations of mesalamine used to treat ulcerative colitis, and this drug may be given orally or in an enema. Mesalamine is a 5-ASA drug that is associated with fewer side effects than Azulfidine because it does not contain the sulfa component. A CBC count and a liver function test may be completed before starting this drug in order to get a baseline level. However, there are no recommendations to continue testing during therapy. 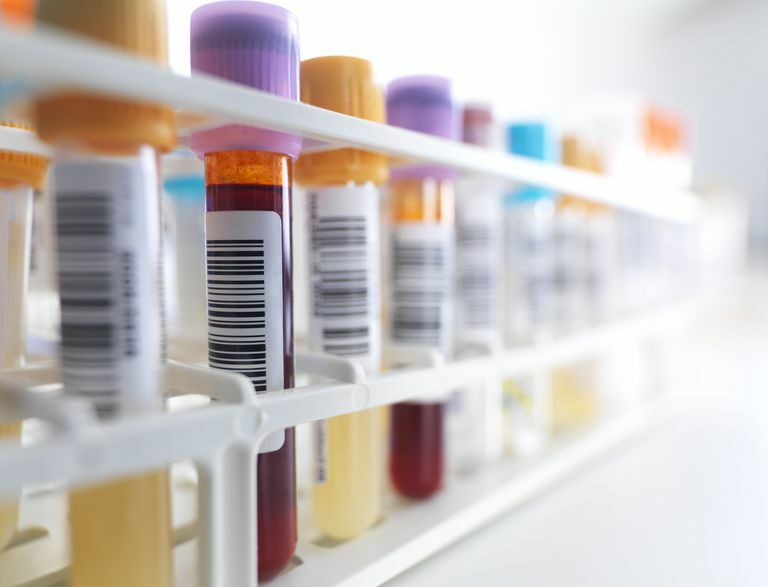 One test that might be done more frequently is a creatinine level. Mesalamine is a maintenance therapy often taken for long periods of time. A creatinine level might be ordered before starting this drug, at six weeks, at six months, at one year, and then yearly. A creatinine level is used to help monitor for a rare adverse effect where the kidneys become inflamed, which is called interstitial nephritis. If interstitial nephritis is suspected, treatment with mesalamine will be stopped. Methotrexate is an antineoplastic drug that’s used to treat Crohn’s disease, ankylosing spondylitis, rheumatoid arthritis, and psoriasis. It has been shown to cause fetal abnormalities and therefore should not be taken by women who are pregnant or who are seeking to become pregnant. It’s important to discuss birth control options before starting this drug. Before starting methotrexate, a pregnancy test might be ordered to ensure that it’s safe to take the drug. This drug can cause miscarriage as well as birth defects. Methotrexate also passes into breast milk, so it is not recommended for use by nursing mothers. Pregnancy tests might also be done throughout the use of the drug if it’s necessary. Methotrexate can affect the lungs and therefore before starting therapy, tests to assess lung function may be ordered. This could also include a carbon monoxide transfer factor and a pulmonary function test to ensure that there are no lung problems that have gone undetected, especially in people who smoke or who are former smokers. A blood count will be done prior to starting methotrexate therapy, and then it may be ordered again after one week and between eight weeks and 12 weeks thereafter. Low white blood cell counts while taking methotrexate haven’t been shown in patients with IBD, but have occurred in patients with rheumatoid arthritis. This test may include BUN, carbon dioxide (CO2), creatinine, glucose, cholesterol, albumin, electrolyte, liver enzymes, and thyroid hormone levels. This is to watch for any adverse effects on the liver and the kidneys. This test might be done every three months while methotrexate is being taken. If liver function appears to be affected based on the results of the basic metabolic panel or other signs or symptoms, a liver biopsy might be done. For people with rheumatoid arthritis or psoriasis, a liver biopsy might be done once a certain dose of methotrexate is reached, but currently, a scheduled liver biopsy like this for people with IBD is not recommended. As always, a gastroenterologist is the best resource for discussing what types of monitoring are needed while taking IBD medications. In most cases, the routine lab work and other testing are done in order to catch any problems early and treat them right away. In most cases the adverse effects are rare but they can be avoided with some simple tests, which is why it may seem as though blood work is being done quite often. Guidelines are there to help physicians determine how best to care for patients, but every patient with IBD is different and therefore not only is treatment highly individualized, but so is the routine testing that is done. Abegunde AT, Muhammad BH, Ali T. Preventive health measures in inflammatory bowel disease. World J Gastroenterol. 2016;22:7625-7644. doi:10.3748/wjg.v22.i34.7625. [No authors listed] "TPMT testing before azathioprine therapy?” Drug Ther Bull. 2009 Jan;47(1):9-12. doi: 10.1136/dtb.2008.12.0033. Jacobson IM, Kelsey PB, Blyden GT, Demirjian ZN, Isselbacher KJ. Sulfasalazine-induced agranulocytosis. Am J Gastroenterol. 1985;80:118–121. Al-Shakarchi I, Lobão B, Henriques C, et al. "AB0230 Pre-methotrexate lung screening for interstitial lung disease – is a chest x-ray adequate?” Annals of the Rheumatic Diseases. 2013;72:A857.